By Tim Royner: Amir Khan (32-4, 20 KOs) is interested in facing newly crowned WBA World welterweight champion Manny Pacquiao (60-7-2, 39 KOs) in the near future if he gets past his next opponent Samuel Vargas (29-3-2, 14 KOs) on September 8 at the Birmingham Arena in Birmingham, UK. Khan, 32, is being slowly brought back by his new promoter Eddie Hearn to ramp him up for a big money mega-fight against Kell Brook. Hearn wants the Khan-Brook fight to take place in December. Whether the Brook fight happens in 2018 is entirely is up to Khan. It’s his choice. Hearn and Brook both want the Khan fight to take place this year in December. 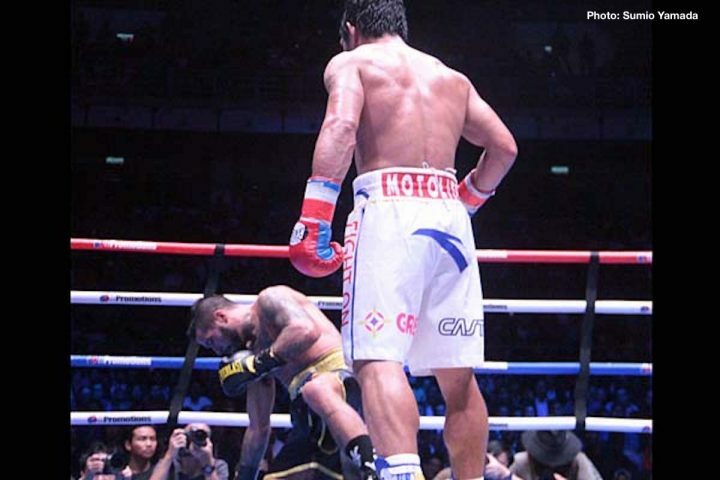 The 39-year-old Pacquiao resurrected his career with a 7th round knockout win over WBA ‘regular’ welterweight champion Lucas Matthysse on July 15 on ESPN+ at the Axiata Arena in Kualu Lumpur in Malaysia. Pacquiao hadn’t fought in a year since losing to Jeff Horn in July 2017 in Brisbane, Australia. Against Matthysse, Pacquiao looked more muscular than he had in years, and showed excellent punching power in knocking the normally strong-chinned Argentinian fighter down in rounds 3, 5 and 7. It’s important that Pacquiao and Khan fight each other before they get beaten again. Pacquiao might still have too much left in the tank for Khan to deal with. The punching power that Pacquiao showed against Matthysse would give Khan fits, and it’s likely that the fight would end quickly. There’s good money in the fight for Khan, but probably not as much as he can make fighting Brook. However, Pacquiao isn’t going to be around too much longer, so it’s not a fight that Khan can put off for the future. If Khan doesn’t take the fight in 2018, he might end up regretting it when the Filipino fighter is retired by the likes of Vasyl Lomachenko or Terence Crawford. It’s no secret that Top Rank promoter Bob Arum BADLY wants Pacquiao to fight his Top Rank stable fighters Crawford and Lomachenko, because those fighters need his scalp to take their careers o the next level to make them pay-per-view guys for his stable. Right now, Crawford and Lomachenko aren’t PPV fighters, but that might change if they can both beat Pacquiao. The good news for Khan is he has a good chance of facing Pacquiao in 2018 if he wants the fight. All he needs to do is give Hearn his marching orders to put the Pacquiao fight together after his tune-up fight against Samuel Vargas on September 8. Khan returned from a 2-year absence last April to defeat Phil Lo Greco by a 1st round knockout in Liverpool, England. It was a nice performance by Khan, who showed improved punching power to go along with his still blazing hand speed. Hearn scheduled Khan in a slight step up against Samuel Vargas on September 8. Vargas isn’t expected to give Khan any troubles.